Very interesting insight into managers doublespeak:-) The traffic depiction in the cartoon is incidental. This could apply to any scenario!!! 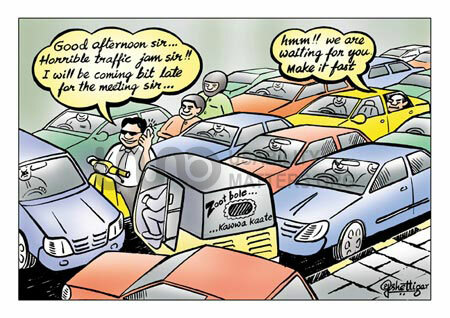 (santa) It gives an idea of the state @ 'Panjagutta Circle', Hyderabad @ 9 am and @ 6 pm. Nice cartoon. :'-D very nice. This we can see everywhere in India. very nice.